“Zorba the Greek” with Anthony Quinn (Alexis Zorba), Alan Bates (Basil / boss), Irene Papas (widow) and Lila Kedrova (Madame) provides the perfect lesson. Being a "book man" myself I feel the pain and helplessness of the boss, longing to be the boisterous, gregarious Zorba with his astonishing love for life and women. 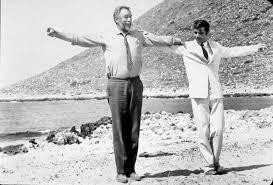 Pushing him towards the widow Zorba told him, "This is an opportunity, you must grab it! That's why God gave you hands!" And just to confuse you: in French “Salut !” usually means “Hello!” but it can also be “Goodbye!” as sung by Johnny Hallyday in “Salut Charlie !”. Lastly, when you can say: “I am brighter when I am with you, I truly am”, then you’re truly with the right partner, your soul mate. By sheer guts, instinct and confidence move from being an observer of the world to becoming a participant. I know what I'm going to do. What's your choice? At any rate whatever you do choose to Live life! Labels: "Adele", "Anton Blignault", "FMS Wine Marketing", "Johnny HALLYDAY", "Juliette Salmon", "Romaine LESAGE", "Ryk Neethling", "Wine Marketing Services SA", "Zorba the Greek"